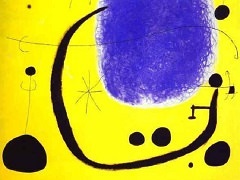 Joan Miro's Siesta, 1925 is highly suggestive of an 'automatic', unplanned and apparently 'spontaneous' production of semi-abstract forms and lines. In Siesta, a single-colour ground contains a dominant flat, white shape and a series of smaller forms and lines. The effect is of a series of fragile forms floating in an atmosphere of some kind: it is hard to suggest any more definite subject-matter. 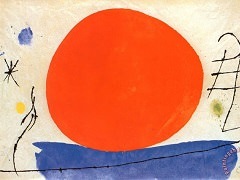 But the two preliminary drawings of Siesta show that the process behind Miro's work is almost the exact reverse of Max Ernst's. 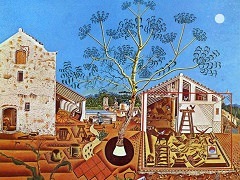 The first sketch shows a fairly conventional scene, at least in art-historical terms - a rural or Arcadian idyll, with mountains, sea, sun, a foreground with playing or reclining figures, wine, food, music, flowers, animals. 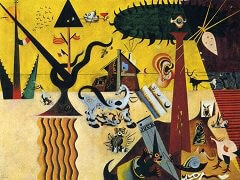 The scene's mood of innocent playfulness is emphasized in 'naive' graphic style Miro adopted. 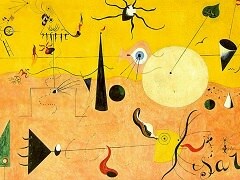 Miro, of course, was no naive. He trained as a professional painter in Barcelona before moving to Paris with the aim of involving himself with Modern Movement. The second sketch is a highly edited, highly schematized version of the first. The figure, house, and clock has been condensed into one shape, the ring of dancers has been reduced to a dotted circle, the mountains have become an independent shape separate from the horizon, the sun and cloud have been combined into a haze of radiating lines. 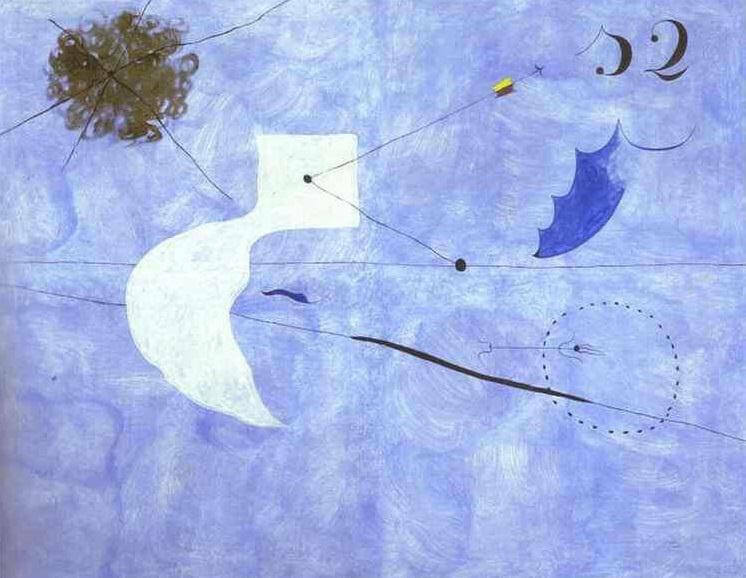 Siesta is a fairly precise transcription of the second sketch, without any major alteration. 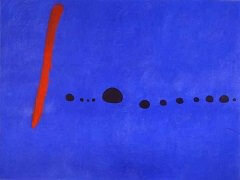 Thus, while there are some generic similarities between Miro's and Ernst's paintings - amorphous, organic forms silhouetted against an indefinite deep space - they are none the less quite distinct types of paintings.